The Canadian Government announced this morning that divers from Parks Canada will dive on the wreck of the recently discovered HMS Erebus in April, months ahead of the originally planned season to begin in July. The archaeologists will be supported by a military operation and will place divers under an ice cap over the wreck site that normally thaws for a few weeks after July each year. There is no explanation for the advanced schedule but archeologists and historians worldwide welcome the new effort to study this important time capsule of early 19th century British exploration. The Erebus was lost in 1845 as its leader, Sir John Franklin sought to discover a north west passage from the Atlantic to the Pacific. Years of searching for the HMS Erebus and its companion ship the HMS Terror proved fruitless – until local legend pointed Park Canada archaeologists to a stretch of water where remote sensing equipment found the wreck. The Archaeology Hour has an interview scheduled with lead archaeologist Marc-Andre Bernier on Sunday March 6th. Results will be reported immediately on the podcast’s blog and a full audio interview will appear on an upcoming edition of the enhanced podcast. 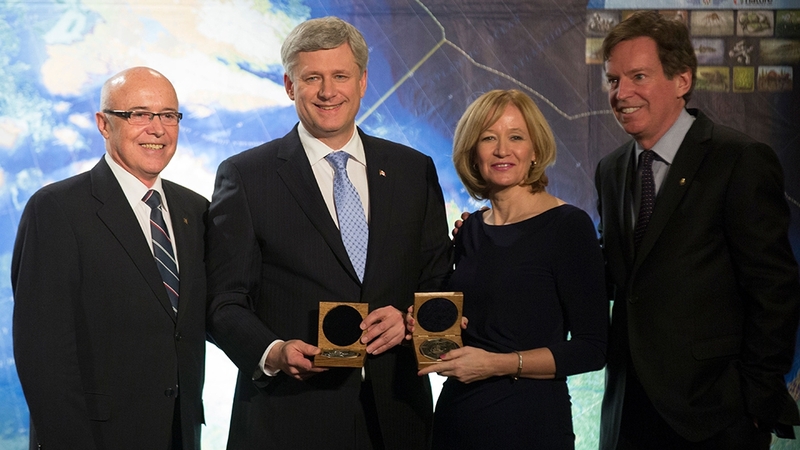 The announcement was made following at the Royal Ontario Museum where the “Erebus Medal” was presented to the Canadian Prime Minister Stephen Harper and his wife Laureen by John Geiger, CEO of The Royal Canadian Geographical Society, and Dr. Paul Ruest, President of The Royal Canadian Geographical Society. The award was made for contributions to and support for the 2014 Victoria Strait Expedition which led to the discovery of HMS Erebus.